Posted in: Magazine. Tagged: 22a, Al Dobson Jr, Deep House, Henry Wu, Hip Hop, Jeen Bassa, Label Profile, Tenderlonious. In our very own mission to uncover the gems in an ever-increasing pool of music, we often rely on the record label to act as the first quantifier of our ongoing listening experience. A particularly good label, one that goes some way to championing a sound and cultivating its roster to help produce (and ultimately release) great music, is more than likely going to be recognised again when that monthly new releases schedule comes knocking. So in a new series of pieces simply dubbed ‘Know Your Label’, we’re going to be profiling some of these small independent imprints that consistently deliver the soul-drenched vibes that we think you should know about. As we dip our toes in the water for the very first time, we head south of the river to seek out Tenderlonious of 22a and have a chat about the label he’s been putting together recently. London has a strong tradition of small boutique labels suddenly appearing out of nowhere. In the recent past we’ve seen many come (and go) – whether it be the army of imprints distributed by Goya that would importantly go on to shape and monopolise the early 2000s West London scene, the continual presence of Kode 9’s highly influential (and suitably eclectic) Hyperdub stable or Alex Chase’s consistently excellent One-Handed Music project. On first look the recently launched 22a out of South London seems to share many similarities with the latter, if only for the fact that its family of producers have close ties to OHM artist Mo Kolours and as such, musically seem to tread similar ground, albeit perhaps in slightly different fields. Back in late November of last year, an inconspicuous split 12″ EP from Tenderlonious and Al Jobson Jr. appeared in the record racks of London’s Sounds of the Universe. A killer slab of vinyl, it houses a mixture of sketches and fully fledged songs that quite clearly bear the marks of two producers influenced by the melting pot of sounds London often delivers. Al Dobson Jr.’s ‘Mellow Man’ (one of the many highlights on the EP), is the type of record you hear at 4am on the Plastics dancefloor, a heads down anthem complete with drunken drums and vocal snippets that hypnotically drift in and out of the speaker cone. On the flip, Tenderlonious drops two deliciously soulful cuts with a languid feel both featuring his own understated voice on the mic, A vinyl only release, the twelve instantly sold out in store but thanks to support from the likes of Alexander Nut, Thristian bPm and guest sets and mixtapes from members of the crew on various blogs and radio stations, more and more people are slowly getting hipped to their talents. Fast forward to the start of this year, and a second slab of hand stamped wax swifly followed suit, once again exclusive to the SOTU shop and this time spearheaded by a new pair of producers, Henry Wu and Jeen Bassa. Both took a side each to dip into their hard drives and share an assortment of sounds, Wu displaying an adept hand at synth-laden future boogie and downtempo house sounds while Bassa offers up various beat orientated pieces that further show his range of influences (for more from Bassa, make sure to check his Rye About It beat tape series on Bandcamp). Q. You dropped the first 12″ back in November of last year, when did you make the decision to launch 22a and what motivated you to do it at the start? I decided to launch 22a towards the end of 2013. I hadn’t planned to start a label at this point in my life – it happened more out of frustration. I knew a few cats making deep music and I knew a few labels were feeling what was going on – it seemed people were talking a lot but not doing a lot about it. So I decided to try do a little something myself to represent for my people – and so 22a was born. Q. 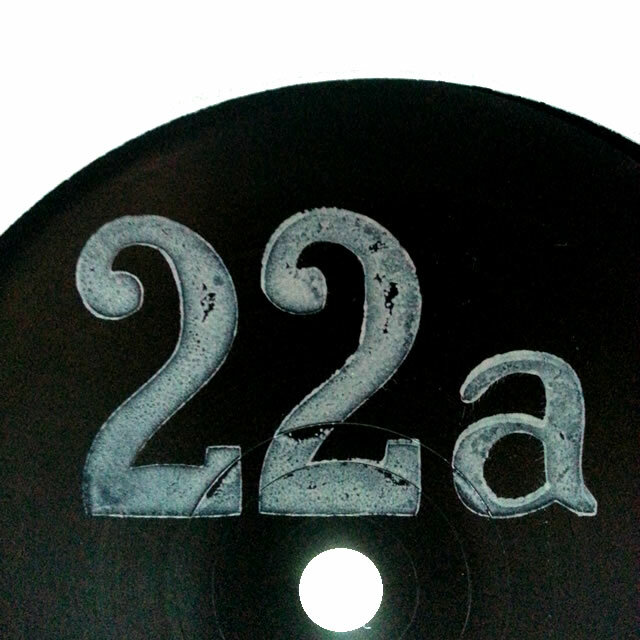 Why the name 22a and how did you initially hook up with the likes of Al Dobson Jr, Henry Wu and Jeen Bassa? 22a is the house I grew up in – its where it began for me! I was introduced to Al Dobson and Jeen Bassa through Mo Kolours. Mo and myself were playing together in Paul White’s band, which is how we met. We started chilling together and from there I linked up with Dobson, Bassa and Reginald Omas – all of whom Mo was living with. As for Wu, we met back in 2010 when we both were working as session musicians for a UK pop singer. We toured around the world for a year, so we chilled together a lot! Q. It seems the label is a vinyl only project at the moment and you’re releasing exclusively through Sounds of The Universe? Is this a conscious decision on your part, perhaps to keep things limited and that little bit special? Are there any plans to make the EPs available digitally in the future? Yeah, its vinyl only at the moment. I grew up in the physical age of music so I’ve always been about that. Digital doesn’t appeal to me too strong. I know it’s the direction of these modern times we’re in; however, I often find myself questioning the validity of it all. If the internet was turned off tomorrow a lot of cats wouldn’t have a great deal to show for their creative output, which is why I think its important physical formats like vinyl are kept alive. I want to document these times without any compromise and vinyl seems the best way to do it! On the flip side a lot of people tell me there’s a wider audience only dealing in digital – so we’ll see, maybe I’ll offer both later on, but its strictly wax for now baby! As for Sounds Of The Universe I was honored that they decided to stock it exclusively. I’ve been passing by their store for a few years and I always loved the vibe in there, so it was always my number one choice. When I cut the first release I dropped them a test press and they were like “yeah! We’re feeling it!” Since then they’ve been repping us hard – much love to all at Sounds Of The Universe!! Q. Are you happy with how things have turned out so far for both releases? It must be nice to have to repress both so quickly? Q. The music we’ve heard from your camp so far seems to be definitely rooted in that organic, almost Detroit, style of deep house and electronica with a little hip hop sensibility in there too. Did you approach the label in a way that you wanted to cultivate that sort of sound or are you simply going to release whatever lands on your desk and catches your ear? Yeah, for now I’m trying to keep it on an up-tempo flex – I like the idea that people can be up in the clubbies dancing to 22a! But, at the same time I don’t want the label to end up catering for only one or two types of sound. Amongst the 22a family we’re all exploring different avenues of music, through both electronic and acoustic methods. I think the fundamental aspect of our approach to making music is that there is no limitation on what or how we do our thing – as long as it sounds dope and the intentions behind it are pure then I’m down! Q. What’s next up on the agenda for you and label? Do you have 22a003 ready to drop and will you be introducing other producers into the family or for the moment, sticking with the same crew? Q. Finally, it all seems to be bubbling nicely South of the river at the minute, particularly with the resurgence of the Peckham underground. Is there any anybody else we should be looking out for this year? Right about now it’s all about the likes of Al Dobson Jr., Henry Wu, Mo Kolours, Jeen Bassa, Paul White and Reginald Omas Mamode IV. Other than that I’m sure some other heads will start to surface this year – it all seems to be happening down south at the moment – long may it continue! For a little audio companion to the piece, check out our 20 minute sampler to discover some of the sounds available on both twelves. If you want to grab them for your own collection, then head on over to the SOTU website or 22a’s own Bandcamp site and go cop the vinyl.